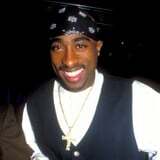 When Tupac Shakur passed away on Sept. 7, 1996, he was survived by his mother, Afeni Shakur, father Billy Garland, and half-sister Sekyiwa Shakur, but what many people don't know is that he also left behind his ex-wife, Keisha Morris. Tupac and Keisha first met at Capitol nightclub in NYC in the Summer of 1994, while she was studying criminal justice at John Jay College and working as a camp counselor. Keisha was 20 and Tupac was 21. "We were dancing, and we spoke briefly. He was going through something legally at the time, and I told him to just be careful of the people he's around and that I hope everything works out," Keisha told XXL magazine in 2011. "I saw him a month later at the Tunnel [another nightclub], and he remembered the whole conversation. He told me he had been looking for me for a month - going to every club. He tried to invite me back to his hotel room. I was like, 'No, that's not happening.' He gave me his number, and I gave him my house number. We started talking from that day on." Despite the fact that Tupac was facing legal charges at the time for a previous sexual abuse incident, Keisha "got to know him" and the two struck up a romance. Tupac ended up proposing, and they got married while Tupac was in jail on April 29, 1995. "[For him] it was more like, 'I don't want you saying you're my girlfriend. I want people to take you seriously and let them know that you're my wife,'" Keisha recalled. In October 1995, Tupac was released from prison, and their marriage was annulled five months later. "Things were getting very different once he got bail, and I felt like I wasn't needed anymore," Keisha said about their breakup. "It wasn't a good feeling. Okay, of course you don't know from being so young. But I just felt like, Wow, okay, it was over. Like, Okay, I don't need you anymore. I'm getting out. That's it." Keisha and Tupac remained friends up until his tragic death. "Tupac was the type of person that if he was through with you, that was it, but that wasn't the case with me. We were still friends up until the day," Keisha said in a 1997 interview. In fact, Keisha was actually with Tupac in NYC the day before he was killed in a drive-by shooting in Las Vegas.